Although today we see the Peak District as a beautiful and relaxing place to visit, this was not always the case. In fact, throughout history, the area of Derbyshire was known as the ‘Dark Peak’. The people of the time thought it to be too ‘wild and savage’ to venture into. Many were put off by the apparent mystery of the wide, open plains and rugged woodlands. However, this mystery has served the perfect setting for many spooky myths and legends, which we have combined below. Have a read of our top Peak District myths to see if we can convince you to check them out yourself! In Stanton Moor, there lie 10 stones in a circle. The 10th stone was hidden underground until a series of floods and droughts revealed it in 1977, long after the arrangement was given its name. The circle dates back to the Bronze Age, between 3,000 and 4,000 years ago, and it supposedly symbolises a group of women who were petrified for dancing on the Sabbath day. There is another stone just outside of the circle which is called the ‘King Stone’ and it symbolises a fiddler. We do not know what this area was for, but many historians suggest that it was either a ritual ground, a burial site, or perhaps simply a landmark for orientation purposes. 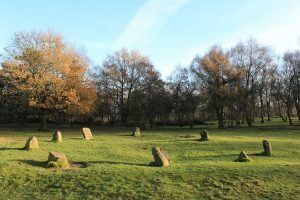 Today, the site is a popular for Pagan worship due to its connections to ancient Druid rituals and sacrifices. Pagans often leave sacrifices at the circle and consider it a site of importance. Some even consider the stone women to have been witches and leave offerings to them. Whatever the circle was for, this mysterious landmark is definitely worth checking out. The villagers of Eyam made the town infamous in the plague of 1665, when they chose to quarantine themselves to stop the outbreak from spreading. This dark past has earned the town the title of one of Britain’s most haunted places. 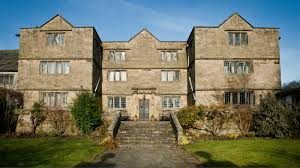 One such building, however, is still the site of many ghost sightings – Eyam Hall. As the legend goes, a servant girl by the name of Sarah Mills drowned in the well near the hall. Apparently her spirit has walked the grounds ever since. There have been so many sightings of her, in fact, that there is actually a book full of witness statements from visitors to the hall. All of them detail a ghostly-looking woman floating around. If you’re the fearless type, then you too can visit the hall until December 31st 2018. To see some of these spooky sites, why not book in to stay at one of our luxury holiday cottages? You can explore uncover Peak District myths and legends by day, and experience cosy, comforting accommodation by night. That’s the best of both worlds if you ask us. Or if you’d prefer the traditional experience, we also have a caravan park.